There are some places in the world that I take great solace in knowing are there – The Sanctuary is one of them. You can do as much or as little at The Sanctuary as you like, depending on your goals, timeframe and budget. Some people just come for the yoga and stay in the dorm, others do a full fast and stay in an air-conditioned villa. I met a girl who brought all her own cleansing herbs with her, did the fast herself and just paid for the nightly colonics. People come from all over the world to follow Moon’s cleanses, which are based on the teachings of Dr Richard Anderson, author of Cleanse and Purify Thyself. He is living proof that the detox works, full of boundless energy and a genuine interest in his customers. I’ve only ever done the 3.5 day cleanse myself, but as you need to eat raw on either side of that, for me it feels more like a week-long cleanse. One day, when I have more time, I’ll go deeper into it. But what I will say is that it’s not for the fainthearted. It’s as much an emotional and psychological journey as it is a physical one. Lots of things come out “in the wash”, so to speak, and you need to be ready for that. But it’s definitely worth it, and you make lifelong friends with the people you go through it with. After your raw food days, Moon conducts a simple saliva test to test the pH of your body and see if you’re ready to begin the programme. If so, he hands over your first few packets of clay and herbs, which you mix and take in your room, and a timetable of what happens when, and sends you on your way. On the proceeding days you follow a strict regime. At 7am you take your first psyllium and clay ‘shake’ (imagine a mixture of pond water, sawdust and snot, and you’re halfway there). Bentonite clay is used to draw out all the toxins, and psyllium acts as both a bulking agent and a brush to sweep up. I saw someone apply the clay to an infected wound from a motorbike accident and it cleared it up completely. Then at 8.30am you take your herbs, another shake at 10am, more herbs at 11.30am and yet another shake at 1pm. Far from feeling hungry, I’m feeling quite sick. I find it hard to get all this stuff down. Then at 2.50pm, you have a ‘lymph flush’ of carrot and cucumber juice, a fourth clay shake at 4pm and – the pièce de resistance – an organic coffee colonic, which you actually look forward to because by that time your stomach feels like a brick. By the time you sit down to the evening broth (made from vegetable peelings, with a sprinkling of chilli powder and a squeeze of lime, for flavour), you’re exhausted. The conversation around our evening broth sessions almost always turned to what people found in their toilet “sieves” that day. One guy reported finding a piece of steak the size of his hand, another long strips of yellow gunk. In the beginning it makes me squeamish, but we all soon become so desensitised to this talk and these pictures that we start showing each other our pictures and comparing notes. Conversations about bowel motions break down social barriers like nothing else. The cleanse programme definitely gets worse before it gets better. My mind does funny things at the beginning. I find it hard to concentrate (something normal for me when I’m hungry). I can’t remember basic words and I keep losing the thread of what I’m saying. My dreams are also troubling. By day two I feel very weak indeed, I have the shakes and I really want to be sick. My stomach is heavy and my muscles are tense and achy. If I could carve out my middle, I would. I spend most of my cleanse days in my hut in a Trainspotting-esque daze. I keep a notebook by my bed and write down all the things that come into my head. I’m coming up with lots of ideas. Thank goodness for the colonics. Expelling all those toxins feels incredibly cathartic. I can also sense old negative thoughts and emotions leaving the system at the same time, which is apparently a normal reaction. Emotions are stored in what Dr Anderson calls our ‘mucoid plaque’ – the stuff that is stuck to our intestinal wall like glue, and inhibits our absorption of nutrients. The only way to get rid of it is to do a proper cleanse. During your cleanse he says it’s also important to stay positive because those emotions will “stick”. By day three, things are starting to look up. I feel quite mellow, calm and soft, like I’ve been purged of lots of negative emotions and had a really good cry. It’s amazing how much you let go of when you’re not eating. How much lighter you feel. And it really helps your sleep too. I’m still tired, but my headaches have gone and my thoughts are more relaxed and slow than they have been for a long time. Cleansing works wonders for your mind. I realise I’ve been stuck in a mental loop for a long old time, going over and over the same old thought processes. By getting rid of physical waste you also get rid of mental waste, too, and clear the path for new ideas. Niggles and pointless concerns ebb away without effort, and new realisations come to the fore. It feels like the windscreen of my mind has had a good polish. I can remember conversations and dreams I had as a child. Back on the raw fruit and veg, I feel like I could go on for ever. And I kind of want to. I’m sleeping like a baby and feel stronger, calmer and healthier than ever before. I start going to the yoga and meditation classes (which were unthinkable during the cleanse proper), I pay a visit to the natural steam room built into the rocks, and I visit the spa for a Balinese body treatment with ground nuts, coffee and warming spices. I’m also very happy to be eating again. Just having flavours in my mouth feels amazing. According to a holistic nutritionist from Toronto that I met there, stress matters more than what you put in your body. There are those people who eat healthily but don’t live as long and there are those who eat whatever they like and live to a ripe old age. It doesn’t matter all that much what you eat, it’s the presence of stress and the way the food is prepared. If it’s been made with love and care and good intention, and you eat it feeling happy, chances are it will do more for you than if it’s anonymously manufactured, hermetically sealed and thrown down the throat on the way to the bus. Moon says he’s had doctors come into the centre, take one look at the goings on and walk straight out again. Then again, he’s also had doctors come in and ask questions because they’ve never heard of the cleanse before. As he says, if you want to be helped he can help you, if not then he can’t. The Wellness Centre has a mini library with some very interesting, and often provocative, reading material. I read The Cure For All Diseases by Dr Hulda Regehr Clark cover to cover on my last cleanse, and was fascinated by its contents. I became so evangelical about its ideas and radical treatment methods that I had a few debates with people on “the other beach” about it. There are also other books at the Wellness Centre that challenge the status quo of health, and the health industry in general, especially pharmaceuticals, and it’s a great to educate yourself while you cleanse. Whatever the arguments against fasting are, in my view, the pain is worth it. My skin is clear, my sight improved, like my eyes have had a good wash, and my thoughts calmer, softer and more centred. Colours seem brighter and food more intense. I find it easier to make decisions, and am ready to move forward with my life. If I’ve learned anything this past week – apart from eating as much raw food as possible and going to bed on an empty stomach – it’s that what’s going on inside your body is reflected in your mind, and vice versa. When we clean one, we also clean the other. In fact, another lesson I took away from this is to regularly purge and sieve everything in life. Whatever is left over is the real deal. It’s amazing what comes out in the wash. 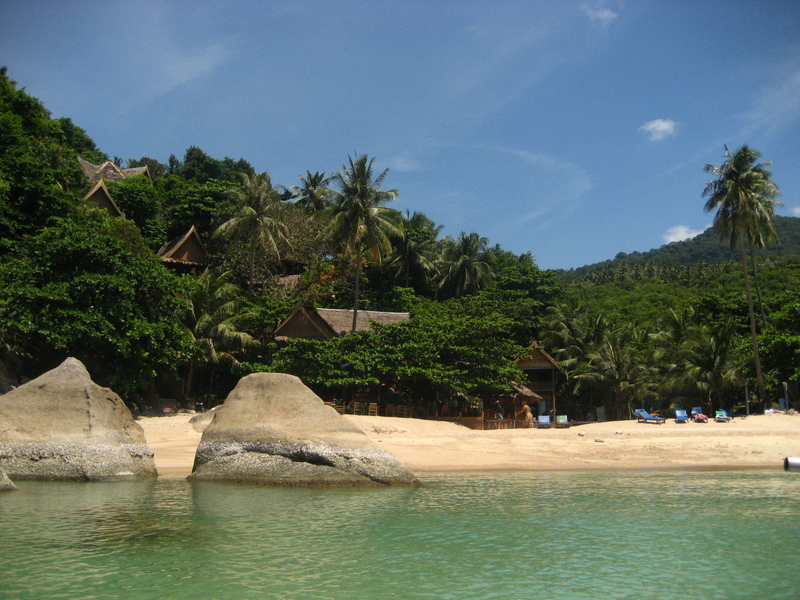 The Sanctuary (www.thesanctuarythailand.com) has a range of accommodation, from dorms (120 baht a night) to deluxe family suites (5,400 baht). 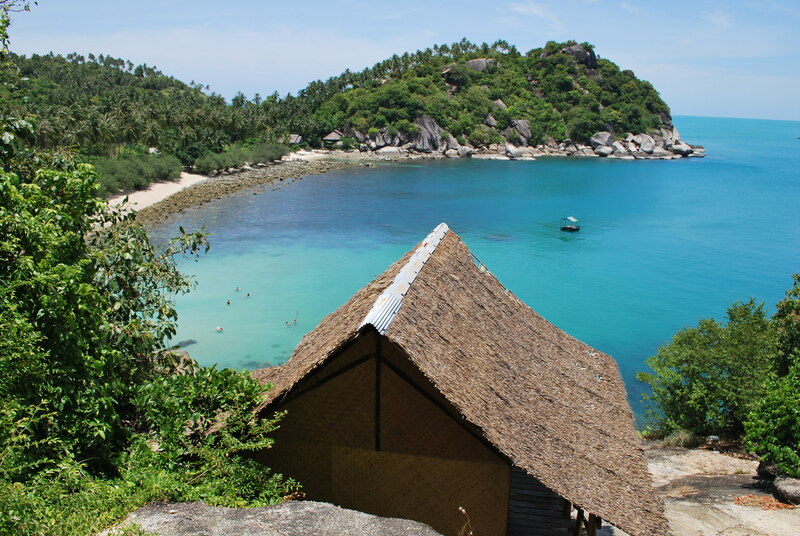 Alternatively, a basic beach hut in any of the smaller resorts costs around 300 baht a night. A quick one-day cleanse at the Wellness Centre costs 2,500 baht. The seven day cleanse is 15,000 baht. The Sanctuary also runs a retreat in Sparkford, Somerset. 1. From Bangkok. Fly to Koh Samui (bit expensive, but really handy). Spend a night in Mae Nam, then take the ferry straight to Had Thien the next morning. 2. Or fly to Surut Thani (much cheaper), then take the ferry transfer (Raj or Lompraya) from the airport to KPG, then a taxi to Had Rin and a long tail to the Sanctuary. 1. Go to bed on an empty stomach and make your last meal a raw one. This gives your body chance to process toxins from the day, and it means you need less sleep. 2. Take one day a week to fast completely or simply eat raw foods or juices. Kombucha is great for this. 3. Drink plenty of water, around 2-3 litres of filtered water a day, if you can manage it. More if you live in a hot country or it’s summertime. 4. Prepare for any serious cleanse by eliminating sugar and caffeine from your diet a week beforehand and eating raw for as many days as you can prior to the cleanse. 5. Papaya is an excellent fruit to come off your cleanse with. Introduce other foods very carefully and slowly. You may wish to eliminate some things altogether. It’s a good chance to assess what foods make you feel good, and which you would like to give up. Maybe this is the time to go vegetarian or vegan?! Yay The Sanctuary! I have never been there but my dear friend and teacher Peter Clifford teaches there! He is amazing…. is he there? Have you had the pleasure of one of his classes? You must see him if he is there and tell him Theresa from Santosha in Bali says hello and I love him! 😉 Enjoy your cleanse… I am jealous and hope to get at it soon… once we get out of Africa… Namaste!